Launching a church is no simple task. It’s something that takes faith, preparation and the ability to share a vision of what’s to come. Ask any church planter what is was like for them. One thing is certain, each experience will be different from another because of the uniqueness of the cities, and the people that call them home. What works in one city, may not work in another. Are they in a city that culturally is familiar to church life? How many churches exist in that area already? What needs are facing the community? These are just some of the questions that could run through the minds of church planters. From southern California to Harlem, from a small town in Ohio to a blue-collar city like Detroit, one thing is sure; there are pastors who are willing to go and further the kingdom of God, no matter what it may look like in the context of where they are. “We were as grassroots as grassroots can be,” said Taylor Wilkerson, Pastor of Trinity Church in Harlem, New York, when referring to finding servant leaders for his launch team. “I always had a huge heart for tangibly affecting the lives of people, not just preaching Jesus and sharing hope that way, but by meeting the needs of people,” said Taylor. Taylor grew up in the ministry with his parents Rich and Robyn Wilkerson at Trinity Church in Miami, FL. Now, as Taylor walks the streets of Harlem and pastors a hurting community, it’s closer to home for him than what some may think. “From the outside, it does look a little odd, you are a white guy going into a black neighborhood, but since I was eight years old, my whole life was in a black neighborhood. I grew up in an inner-city church, and it’s all I knew. We were the only white people,” said Taylor. “I literally have a photo of me, and I am the only white kid in the choir, and I am swaying the wrong direction! That’s what I grew up in. It just feels how I grew up for me here. I feel like I am in my context because it’s all I knew,” he said. Taylor wanted to make sure that their church would be one that serves and shows the tangible love of Christ. Their first year before launching consisted of interest meetings and serve days on Saturdays. “I started going to the projects and playing basketball. I was recruiting baristas, waiters, and waitresses. We partnered with organizations and we gave groceries to 500 families,” said Taylor. He cast vision about a church that would speak to social justice issues and topics that were facing the community. “You can’t do ministry in a context like this and not address social injustice. You have to talk about racism head-on. We have to address poverty in our community. Those are the real issues that plague our community,” said Taylor. Chris and Kristyn VanBuskirk were the first ARC church plant in Ohio. They launched Centerpoint Church in the fall of 2009. Their city has a population of about 23,000 people. It’s a small town, and for the VanBurskirk’s, small town cities in Ohio are their mission. “There is a lot of hustle and grit in small towns. One of the challenges, when you are in a small town, is embracing your limitations without lowering your expectation. We have still pushed to pursue excellence and not make excuses why we can’t or won’t do things a certain way. We don’t do leftovers. We give God our first and best. That is very unique in a small town,” said Chris. Chillicothe was the capital of the state of Ohio twice. It was the 1st and 3rd capital. 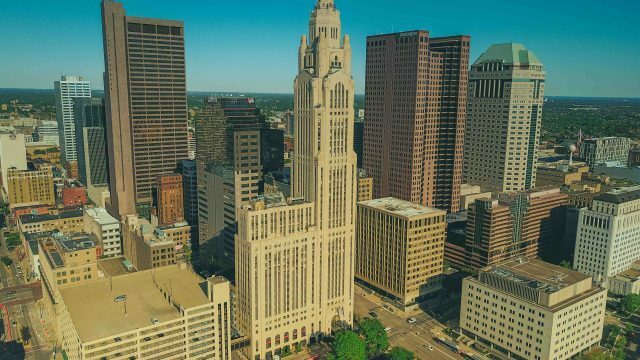 The city is located about an hour south of Columbus, northwest of Cincinnati and has experienced some revitalization in the last ten years. It’s a blue-collar town, with white-collar jobs. The median age is 38-39 and has gotten younger over the last decade. And although the city received some bad press in the past, Chris and Kristyn like to remind people that they are not forgotten. “There is this feeling of Chillicothe as this forgotten city. Our heart is for the forgotten cities in Ohio. We think there is significance in small towns. Jesus came from this little town of Bethlehem, and it wasn’t really on the map until he showed up and God is always in the business of using small towns to do big things and using ordinary people in small towns to do extraordinary things,” said Chris. “We were not just going to be a church for our city, but for Ohio. That’s our mission, to plant life-giving churches in small towns,” he said. For Guy and Ashley Hoss, launching a church in Bakersfield, CA means bridging gaps and creating a church that reflects the heart of God for hurting people to call home. They launched Story Church in September 2018, and they hope to be a church where people can understand what having a relationship with Jesus is, not just religion. “For us, the vision God gave us was 1 Cor. 13:13 (NLT), ‘Three things will last forever—faith, hope, and love—and the greatest of these is love.’ If we don’t show love, we have nothing to offer people. Even with our outreaches, I tell our team, we are going to share the love of Christ, and if they want to come to our church then great,” said Guy. Guy grew up in Bakersfield, but since he has been gone for 20 years, he had to build his launch team from scratch and start serving the city. He says that the city still has somewhat of a racial divide. “Bakersfield is a very diverse city, but churches have to work at being multiethnic. You have to work at bridging gaps and breaking down racial walls,” he said. Bakersfield is located in the San Joaquin Valley, a little over 100 miles north of Los Angeles. The city is a significant hub for both agriculture and oil production. However, the more devastating statistic is the meth problem among people including juveniles. In a report done in 2014, 50.2 percent of felonies in Bakersfield were charges related to meth and numbers show it’s getting worse among juveniles. As for Guy, he is aware and wants to connect with those who find themselves in these situations and help them find a true relationship with Jesus. “There is a huge mental health concern in this city, so there is a lot of brokenness. A lot of churches focus on the rules versus building relationships. A lot of the youth have grown up with a bitter taste in their mouth about what they can’t do vs. a relationship with Jesus. There are a lot of people turned off by God and religion,” said Guy. Pastors Robby and Danielle Emery planted One Oak Church in Detroit, Michigan. The city itself hit some hard times, and in 2013, the actual city of Detroit filed for bankruptcy. Two years after that when Detroit started climbing out of the hole, the Emery’s simultaneously started feeling something in their heart to plant a church in the city. They had grown up years ago in the area, but were living in Texas and doing ministry there. “Michigan is a blue-collar state, and it has a Midwest mindset. You have to convince people who think, ‘Why should I give my time when I have worked over 60 hours this week?’ or, ‘Why should I give any money that I have spent so much time at earning?’ What we have been able to do is show them how we are generous, and what that look like,” said Robby. Their church pulls from a three-county area. It’s a very religious area, including Catholic, Jewish and Muslim followers. For example, Dearborn, a suburb of Detroit, which is about 10 minutes from where the church meets, has the largest Muslim population in the country. “Christian is not the first thing you think of when it comes to this area,” said Robby. “There are some life-giving churches, but going to church is not the common culture here. But there is now an appeal to go to church with the resurgence of the city. It’s about relationships with the city and people,” said Robby. “We have found that because of Detroit having this comeback, it takes a little more time for them to trust us. We are finding that our consistency, generosity, kindness, and love that we show towards the community are what make a difference,” said Robby. The Emery’s are both bi-vocational. Robby works as an advisor to players and coaches for the football team at the University of Michigan. He is an adviser but is known as a “soul coach.” He feels that by them working, its great way to connect with those in his church. “It shows our church that we are doing everything it takes to make the church grow. Even on Sunday, we are the first to arrive. I pull the trailer and Danielle sets up spaces. We are not asking them to do something that we are not willing to do. That has been huge in the blue-collar, Midwest part of Michigan,” said Robby. When talking to these pastors about their heart for their city, one thing was evident, understanding the context of where they live and serve is strictly based on the needs of people. Although one may think of the circumstances of rent costs, or transportation issues, their focus is on meeting their needs and helping them find Jesus. As Taylor said, “No matter what context God has called you to, there are needs. Whether it is a small town or large city, get to know people and ask, how could our church help serve this city?” And that’s exactly what they are doing. This article was originally published in the ARC Magazine Sept. 2018 vol. 3 iss. 2.